Any book on success talks about visualizing your goals. Today I/we did more than visualizing, we visited. We visited Yale, one of many colleges that my son Matt thinks he might like to go to. It would be a stretch for Matt academically. We live in a primarily blue collar town and about once every 5 years someone goes to an Ivy League school and it is usually Brown or Cornell, not one of THE BIG THREE (Princeton, Yale or Harvard). I was actually a bit surprised he wanted to visit Yale, but pleased that he does have such visions. Wow, what a school. The facilities, faculty, dormatories, libraries, gyms, programs, and of course the student body itself. A college environment couldn't come any richer. By rich, I mean having an abundant supply, not the price tag associated with it. Yale's new financial aid policy means it could come with a lower price tag for some middle class families, than other private colleges do. But there is a price to be paid. 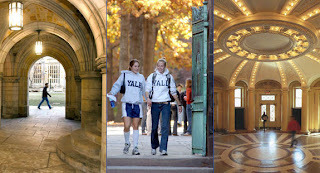 Yale demands both talent and proven accomplishments. I think Matt will be that much more focused in the next year on maximizing what he can offer such a college, building his skills and accomplishments. And I will have Yale (or a school that Matt might like even more) in my mind as I completely change our financial picture. Yes, a clear picture in mind is important. But if it's possible to actually visit your goal, truly see yourself there, make the trip and be sure to enjoy it.